Kevin McGoldrick, joint manager at Kilsyth Rangers. 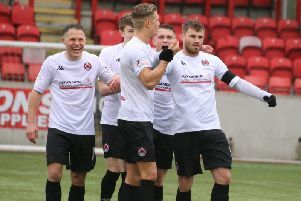 Kilsyth Rangers suffered another disappointing road trip as they went down to Darvel on Saturday. The win-lose sequence has been the pattern so far this season and the signs are not good; unless the defence can be shored up, and quickly, there will be far more games lost than won in the coming weeks. Darvel are no world beaters but they saw and exploited the lack of pace and mobility in the Rangers rear. Yet again Kilsyth lost an early goal, something which is becoming a very unfortunate habit, when Paul Cameron got to a high ball first to put Darvel ahead after just five minutes. It was painfully obvious even at this stage that Darvel were able to get past the Rangers central defence far too easily and threaten Davie Buchanan’s goal and he had to make a few saves to prevent further loss. Rangers did make some good attacking moves with Franny Kelly prominent and it was appropriate that he should get an equaliser after 16 minutes with a low shot from around 20 yards. It was a fairly even game at this point but when Darvel were awarded what seemed a very soft penalty for a holding offence they went ahead again with Ian McCreadie converting their spot-kick. Not much in it at half-time with the home side just shading it on pressure. Rangers resumed with Danny Smith on for Chris Reid who had hurt his back in the first half. Darvel were cutting through the Rangers defence with ease and came close on a number of occasions, including having one good effort come off the base of the post. Eventually a free-kick brought their third goal from Vernon, although Buchanan may have had his view obstructed but made no move for the shot. The defeat leaves Kilsyth seventh in the table.